Picture taken by AWL iPhone! Many times rescuing dogs can be difficult, but also very rewarding. Plenty of times we read with our hearts more than our intellect, and when it comes to some breeds it can be a difficult case if (we are) having no experience. Perhaps they have a stronger mind, they are bred to guard, fight, etc. 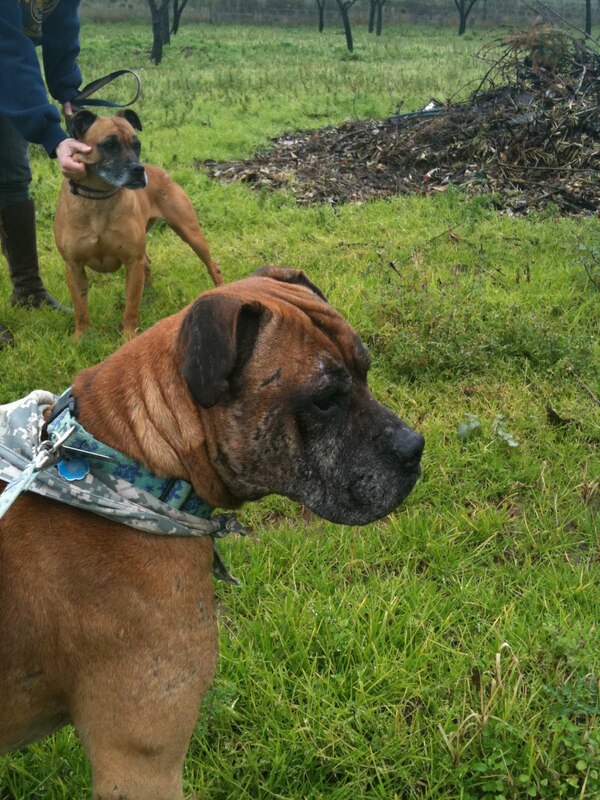 These two Mastiff mixes have lived in an abandoned car for some time; how long, no one knows. But they lived in that car wreck like a married couple, taking care of each other. They were brought in to a family’s garage, being loved and fed. AWL was called in to see what had happened to them and if we could help. A little nervouse since this breed has a strong energy, and since no one knew their background we didn’t know what we were dealing with. They had good energies and were very friendly. You could tell that they had had owner(s), but what kind of owners? They were full of scars, big scars and we knew they were former dogfighters, who had somehow escaped, and now were out in their freedom. Freedom but for how long? Since they look rough and with the already “dangerous” looking breed, people will naturally become afraid. They will find a reason to kill them! Many Campania people are very protective over their children–but it has a double affect–the children becomes scared and screams at things, which will scare the parents. I have only had good experience with these kind of dogs…. but I have seen what the humans can do to them too, out of pure evilness. Let’s give these two “oldies” a good relaxing home still with exercise and mental training. We (Animals Without Limits) will help you with everything: good health and good mentality….